The explosive sound that is normally associated with a sonic boom occurs when an object goes faster than the speed of sound. An object that breaks the sound barrier is pushing the surrounding air away and it creates pressure waves in front of and behind the object. When these waves travel at such high speeds, they can’t avoid each other. When they come together, they become a single ear-splitting shock wave known as a Mach cone. With light, creating a photonic sonic boom is a little more tricky. Theoretical physics tells us that nothing is faster than the speed of light. But light can go slower than its top speed when it moves through materials like glass. Researchers at Washington University in St. Louis decided to take advantage of that fact in order to test a longstanding theory that light can also create conical waves. They’ve now published their results in a paper at Science Advances. First, study lead author Jinyang Liang, an optical engineer at Washington University in St. Louis, and his colleagues designed a narrow tunnel filled with dry ice fog. This tunnel was sandwiched between plates made of a mixture of silicone rubber and aluminium oxide powder. Then, the researchers fired pulses of green laser light — each lasting only 7 picoseconds (trillionths of a second) — down the tunnel. These pulses could scatter off the specks of dry ice within the tunnel, generating light waves that could enter the surrounding plates. The green light that the scientists used travelled faster inside the tunnel than it did in the plates. As such, as a laser pulse moved down the tunnel, it left a cone of slower-moving overlapping light waves behind it within the plates. 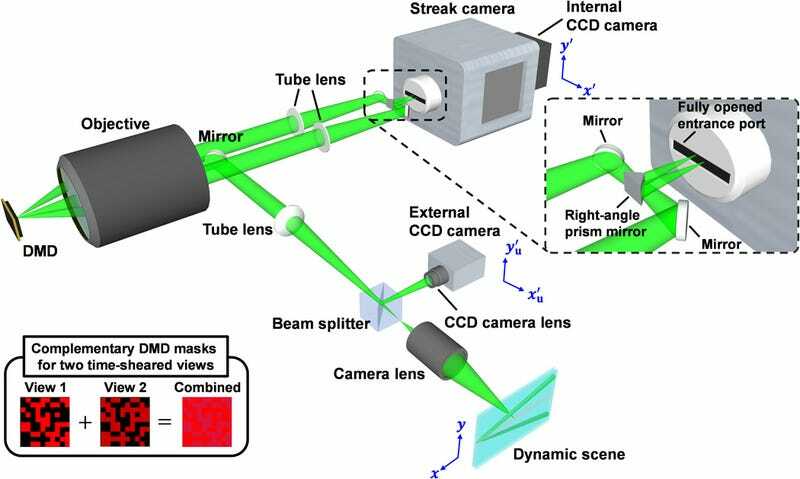 The “streak camera” that was developed especially for this purpose captures 100 billion frames per second in a single exposure, making it the fastest camera in the world that only requires available lighting. The camera photographed the passing light from three different views and the images were combined to give us a moving image of this illusive phenomenon. The coolest thing about all of this is that the high-powered streak camera records ultrafast events in a single burst, which allows it to capture unpredictable occurrences that may not repeat themselves. The researchers hope that the camera system will be useful for applications in neuroscience and other fast/complex biomedical events.